Now that I’ve read Kevin DeYoung’s new book Crazy Busy: A (Mercifully) Short Book about a (Really) Big Problem (Crossway, 2013, 124 pages), I’ve formed an opinion on this question. Probably most of us. By the way. It delivers on the promise of brevity. I got through it in one sitting reclining on the couch while watching UCF lose to South Carolina. I thought I was perfecting my well-honed art of multitasking. Turns out I wasn’t even “switch-tasking.” See page 60 for more on that myth. Some books are written because the author knows something people need to know. Others because the author has seen something people should see. I’m writing this book to figure out things I don’t know and to work on change I have not yet seen. More than any other book I’ve worked on, this one is for me. That kind of humility draws me. I can take my cue from a guy like this. 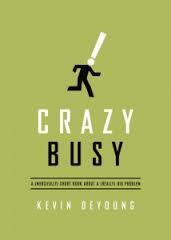 Crazy Busy is insanely good. I commend it to anyone who “feels frazzled and overwhelmed most of the time” (p. 16). The book follows a simple and straightforward 3, 7, and 1 outline – three dangers to avoid, seven diagnoses to consider, and one thing you must do. It consists of ten chapters, 118 pages, not counting indexes. Buyer beware. If you desire a self-help resource with a checklist for increased efficiency and quantum productivity, leave this paperback off your Christmas list. DeYoung goes hard after the heart. Chapter three on pride threw me under the bus, where I belong, I might add. Were I still raising kids, chapter six would have leveled me. Though it’s not my issue (I have plenty of others, Lord knows), the chapter on social media and its dangers is worth the price of reading admission in its unpacking of the 21st century malaise of acedia. I confess. I never heard of that word until now. Read the book for yourself to learn about it, especially if you spend endless hours on the Internet. This self-confessed busyaholic (my term) takes no prisoners on the road to recovery. Prepare to have your categories challenged, your behaviors examined, and your motives unveiled – as well as your prescription for health detailed. The book is biblical and practical. You would expect nothing less from a Gospel Coalition spokesman. Some chapters may suffer from the minimalist treatment, but he did promise to keep things brief. For those who desire more, DeYoung offers annotation with multiple resources and even cites them at the bottom of the page for the convenience of the reader. I love this guy! If I ever write a book, I promise, I won’t make readers (assuming anybody wants to read what I write, of course) turn to the back of the thing to check the references. I hate that. I am too busy for that inconvenience. I found chapter nine particularly encouraging. It represents the best of the best in this little jewel in terms of its balance. DeYoung doesn’t pretend to have all the answers. He takes the path of the fellow traveler on the road of finding a middle ground between being crazy busy and redemptively busy. He doesn’t take us off the hook about busyness. Laziness isn’t the answer anymore than frantic over scheduling is. Even the Apostle Paul experienced the challenge of daily concern (anxiety) for all the churches (2 Cor. 11:28). I shepherd only one church. Its concerns I find more than overwhelming. I should not expect to be exempt from the good suffering that is being rightly busy. I just want to learn better how to steward these pressures along the way. 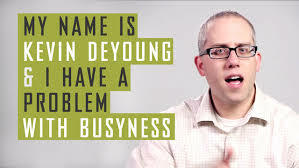 Thank you, Kevin DeYoung, for contributing to my shalom as one who desires to be less crazy busy and more redemptively busy. FYI, I am incredibly pleased to report that copies of this book arrived at OGC this week. They will be available tomorrow morning in the resource center for the crazy low price of $5 for those not too busy to secure a copy. Great review! I do look forward to reading this. I’ve appreciated one of his other books, The Hole in our Holiness. And, if you ever do write a book, I plan on reading it!! Thanks for the encouragement, young lady! I am attempting to carve out enough time to buy, then read, this book. Thanks so much for sharing this. I’m glad to know another quarterly recommended reading is coming at OGC!